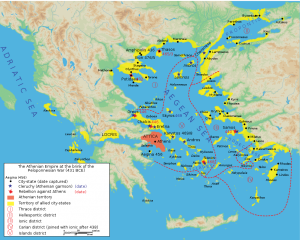 One of the consequences of the first Persian War was a division within the Greek world that was in part based upon the fact that Athens had come on in that war to become a great power and by anybody’s reckoning had played one of the leading roles in the victory. Now, the Spartans had too; the Spartans were the official leaders, and their regent had been the commander at the great land battle at Plataea and their general was in charge of the navy, but Athens had become so important, so big, so successful that there was now a question — I mean, was Sparta really the leader of the Greeks? What was the future? Was the future going to be one in which the Spartans would maintain the unique leadership of the Greeks or would the Athenians challenge them? Now Sparta, as you’ve seen, when the decision had to be made as to whether they should commit themselves to defending the islands with a kind of a permanent force out there to do that, the Spartans withdrew. Nothing is formal; there’s no change in the arrangements, but they just decided to go home. Now we see that the Athenians will be pursuing a different policy — the one that was ultimately adopted by most of the Greeks, but which allowed the Athenians to come forward and make the kinds of claims for their influence that they would. One of the first things the Athenians wanted to do, and I remind you, that the Persians had marched into Attica, and done fearful damage to the polis of Athens and had done great harm to the city of Athens. They had gone up to the Acropolis, destroyed the temples that existed there, a terrible sacrilege from the point of view of the Athenians, and they wanted to do what they could to see this would never happen again. 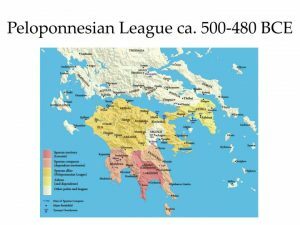 The Peloponnesian League certainly didn’t have anything like that in terms of numbers of states. But don’t be too carried away, because lots of these places are just tiny little spots, especially when you’re talking about islands. Some of the island states in the Aegean and they apparently were just about all members, are very small indeed. Still, it includes some very important states like those big islands I mentioned already Samos, Chios, and Lesbos, and others that were not quite as big, and some states on the Asian side that were old, and big, and important cities, Miletus being one example of it. So, there it is, notice what I have not included. No Peloponnesians. This is not in any shape, manner, or form connected with the Peloponnesian League. That was not the view taken by the Athenians, or I guess, by most of the allies, but we can imagine that there were some of the allies, who were restless in their need to continue to make contributions to the league when they didn’t feel that there was any purpose to the league anymore. I gave a hint to this earlier. I don’t remember whether General Grunther was the second commander of NATO, but he was an earlier commander of NATO, obviously a West Point man, educated, he knew all about Thucydides and the Peloponnesian War and so he made the analogy — the first time I’m aware that anybody did, between NATO and the Delian League, and he was doing so as commander of NATO at a period when he felt that the American allies in Europe were more and more reluctant to make the kinds of contributions that he thought they should make and was bewailing his situation, which was every time the Russians looked like they were going to behave, then the allies decided they didn’t want to make any contributions, and then when the Russians looked scary, everybody came running and said, sure we’ll contribute and he suggested that’s the way it was in the Delian League too. So there was the Battle of Eurymedon, which is generally dated to 469, a great victory at land and sea over the Persians and the feeling that it generated, certainly in some portions of the empire, that the threat from Persia was over, and that created the problem of keeping the allies satisfied and willing to make the kind of contribution that had been necessary. The Athenians certainly had no plan of abandoning the league, of abandoning their leadership, of giving up their assaults on the Persians and all of that. So, that if there was a falling away the Athenians would be wanting to do something about that. 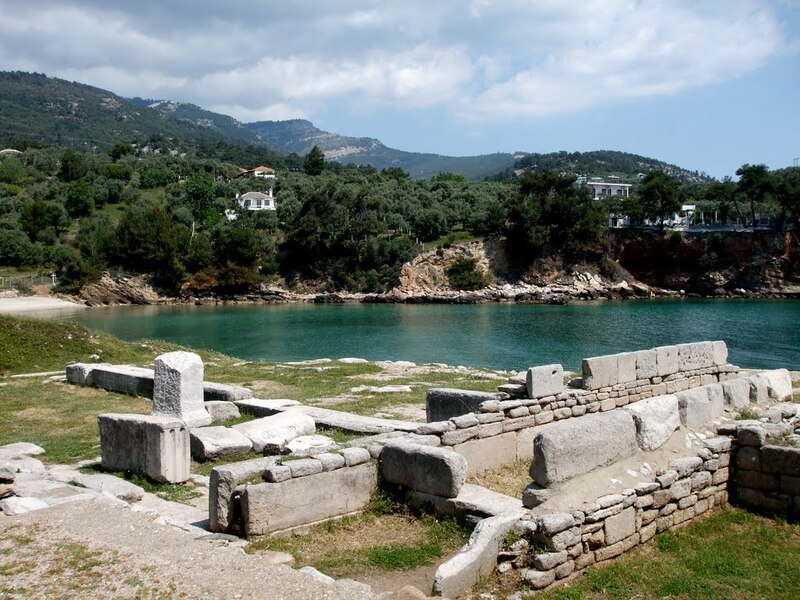 Still another turning point in the character of the league, a very important one I think, occurred in the year 465 when the Island of Thasos in the northern Aegean Sea rebelled, and this time the quarrel was not about doing the duty that the members of the league had to do. It was not something about an issue not wanting to take part in campaigns, not wanting to make payments, no nothing like that. 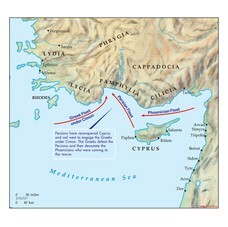 There was a quarrel between the Athenians and the Thasians about some mines that were worked on the land opposite Thasos. Gold and silver, very rich precious metal sources for the ancient Greek world, of which there were not many, located on Mount Pangaean on the mainland opposite Thasos. Both states claimed those mines and it was a quarrel that was really just about money. It was also a trading post up there that both sides claimed to have. The Athenians had established a colony at a place on the Strymon River up in that region called ennea-hodoi, the nine roads, which would later, when the Athenians established it as the colony would be called Amphipolis. All of that led to — and the Thasians didn’t like that. The Athenians were moving into their sphere of influence and giving them trouble. So Thasos, as a consequence of all of these quarrels, rebelled and it was a very difficult siege that the Athenians had to employ. Thasos is a relatively big island. The Thasians were a pretty tough group to put down, and the siege actually, the war between Athens and Thasos actually took something like two years, which is quite a long stretch for any Greek combat and certainly had not been typical of what the Athenians had been able to do against other rebellions. When the Thasians were finally forced to surrender, the Athenians gave them the usual treatment to rebellious states. 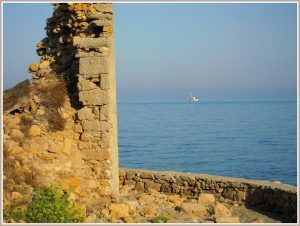 They made them take down their walls, to give up their ships, and of course, the Athenians took control of the mines and placed an indemnity on the Thasians, requiring that they should pay the costs of the war for Athens, and imposed upon them thereafter the same kind of a tribute that they imposed on what came more and more to be, and we call subject states. Well, that wasn’t the first time such a thing had happened to one of the members of the league, but what made it different was that the quarrel was not over anything that had to do with the league. 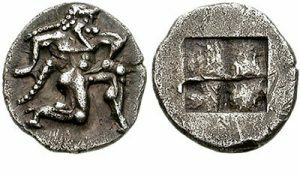 It could easily be seen and certainly was a way in which the Athenians used the forces and the funds of the league to achieve strictly Athenian advantages. After all, there was no way that the league benefited from having either Athens or Thasos exploit those mines. It was not an issue for the league at all, and yet the Athenians had taken their position as leaders of the league to gain that advantage, and that’s I think a very important turning point. We shall see that in the course of that siege of Thasos, important events were happening back in the mainland at Greece, which would change the nature of things too, but if we just think about the league for a moment, I think the Thasian rebellion is a critical moment. That is a good place for us to look at the evaluation that the ancient writers made of this transition. 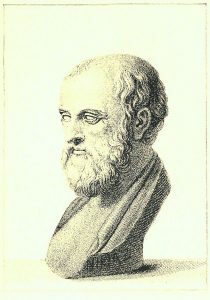 Our two sources, our major source, of course, Thucydides and then also Diodorus of Sicily, deriving his opinions from contemporary writers too, come up with descriptions and explanations of why the league changed from what had been a free association of states pursuing a common goal to what was legitimately called an empire. Here is what Diodorus says, “In general, Athenians were making great gains in power and no longer treated their allies with decency as they had done before. Instead, they ruled with arrogance and violence. For this reason, most of their allies could not bear their harshness and spoke to one another of rebellion. Some of them even disdained the league council and acted according to their own wishes.” So, Diodorus depicts a combined situation of which there are thoughts of defection and actual defections from Athens, and blames this on the behavior of the Athenians of a kind of a tyrannical sort. So, Thucydides certainly agrees with what Diodorus says about the high handed manner in which the Athenians had become accustomed to behave and the offense they gave to their allies. Well, he points out that the allies had gotten themselves into that fix, because many of them — and this is an element Diodorus doesn’t mention, voluntarily said, okay, we’re not going to do this service anymore. 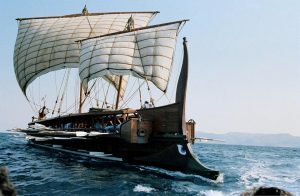 Instead of supplying ships, manning them, doing the service ourselves, we’ll pay the equivalent sum into the league treasury and when they did so, the Athenians took that money and used it to pay for Athenian ships with Athenian rowers, so that as the league forces grew smaller, the Athenian navy grew bigger. So, Thucydides says, it’s their own fault. In some cases it was not, but certainly in many a case, it was. I think we should not think of Diodorus and Thucydides as contradicting each other, they really are complimentary. They’re both telling the same story, but emphasizing a different perspective. One looked at it from the Athenian point of view, one from the allied point of view. But they certainly are telling it as it was, and if we look ahead toward the end of the fifth century, by the time we get to the Peloponnesian War, of all the hundred and fifty or more states that were members of the original Delian League, only three still had a navy and real autonomy by the time the war broke out. The three great islands off the coast of Asia Minor, Lesbos, Chios, and Samos were those states, and sorry, I should have said two, because by 440-439 Samos lost its independence. So, there were only two states in that category. Looking ahead that’s what will happen, that’s will be the end of the Delian League, it will be the Athenian empire in every respect. Now, while this development was taking place we need to take a look at what was happening back in the Greek world on the mainland, and chiefly I think we should focus on Athens at this time. There was right after the Persian War, as I said a few words about it before, a rising competition for a place of standing in the Greek world. That is to say, before the Persian Wars were over, Sparta had been unquestionably the leader of the Greeks, when challenged by an outside force. After the war, Themistocles, you recall, and obviously with the Athenians at his back asserted at the very least equality with the Spartans, and certainly independence of any position following the Spartans or any grant of leadership to the Spartans. As I think I mentioned last time, the next fifty years or so are the story of the competition between these two great powers within the Greek world for who would be the leader and there would be many a clash in the course of that time. In Athens, the remarkable thing is, if you look at the internal development of Athens, I think you would have said in 479, Themistocles is bound to rise to the top and become the dominant politician in Athens, because of his extraordinary role in bringing victory to the Greeks. But these things don’t always happen that way. I think of course about the Second World War, where one might have thought the same thing about Winston Churchill’s future in English politics, but no sooner was the war won and I think Churchill would have had to gain and was given enormous credit for bringing about that victory. There was an election, almost immediately after the war, and Churchill was thrown out and replaced by his opponents, which tells you about the first rule of democratic politics, the first important question that has to be put to all politicians which is, what have you done for me lately? Well, he had done quite a lot lately. So, there’s another question that you have to put is, what are going to do for me next? I think that was really what was Churchill’s problem. 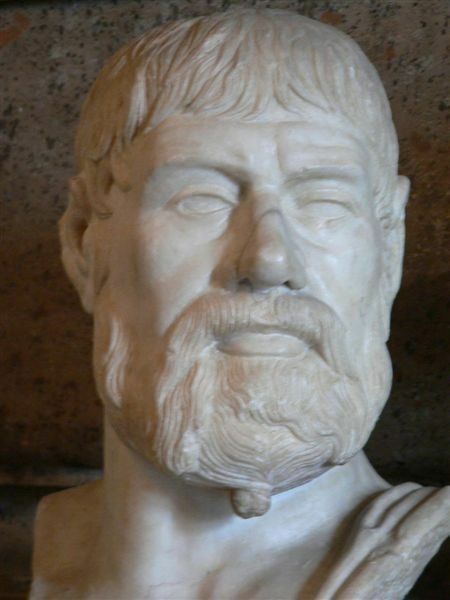 That was not Themistocles problem, Themistocles ran into trouble because he was a kind of a maverick in Athenian politics anyway, although on at least on one side of his family he was a nobleman like the typical Athenian leader. He was not of the real sort of center of the aristocracy; he was some kind of a less than extraordinary nobility in part of his family, and his personality amid his rivals found troubling, because he was not averse to basking in the glory that he had won. But think back, in the eighties, in the years between Marathon and Salamis, on the one hand Themistocles had been able to convince the Athenians to do what they needed to do to survive, to build that great fleet out of the silver mines that they had been lucky enough to have. But also, he had managed, if my reading of the facts is correct, to get rid of everyone of his major political opponents by making use of the device of ostracism. If you look at the eighties, you will see that just about every important Athenian political figure is ostracized with the exception of Themistocles, who was left in great shape while the other folks are gone, and when the Persians come the ostracized men are recalled and play a role in the war, and when the war is over it’s obvious, I think, that they are both not happy with what Themistocles had achieved against them and also worried about their prospects for the future with Themistocles being a bigger hero than he ever was. So what, I think, we need to understand is in Athenian politics in the years after the Persian War, we must understand that there is some kind of a coalition, formal or otherwise, in which all the great leaders of the Athenian political world combine to keep Themistocles down. 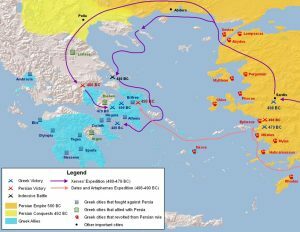 Amazingly enough, when we take a look at the early actions of the Delian League, and which in every case, you remember, the commander of every expedition is an Athenian, it’s never Themistocles whom you would have imagined would have been leading all these expeditions. He just didn’t have the political clout to get the assignment. 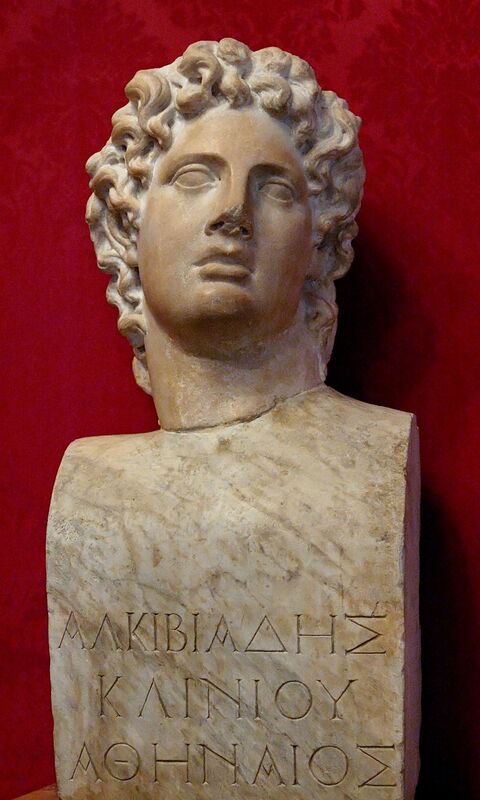 The man who did was a relatively young man by the name of Cimon, a nobleman, he was the son of Miltiades, the great hero at Marathon and he started out his political career with problems. His father had been condemned just before his death, he had also left a very great debt that Cimon had to repay, but Cimon established himself as a great figure in the Persian Wars and very soon afterward, we see him taking the lead in every campaign pretty much that the Delian League launches. He is stunningly successful; he’s obviously a great commander on land and at sea. He’s in charge of the great victory at Eurymedon. So, as Athens goes from greatness to greatness, from success to success, and glory to glory, and from wealth to wealth, Cimon becomes this extraordinarily popular with the masses. It’s interesting, because he was not the sort of a man, who appealed to the lower classes. He was a nobleman himself and he never backed off that, and as we shall see in a moment, his prejudices about foreign relations were not the popular ones. 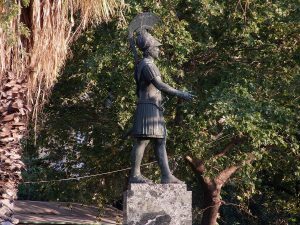 He was a great supporter of Sparta, a great friend of Sparta, who regularly spoke about the virtues of Sparta and the Spartan system, and how Athens could learn something from Sparta. How such a man could have been elected general year after year by the masses of the Athenians is a question we need to approach. But the virtues that he had were to some considerable degree personal, that is, not only was, I think first and foremost, was the enormous success he had in commanding the Athenian forces that brought all the things I had mentioned and wealth, because the league expeditions attacking various Persian territories brought booty, which was to some extent, divided up among the armies that did the fighting. So, the Athenian soldiers and sailors actually made a profit out of these conquests of the Persian territory, or raids on Persian territory. Naturally, their commander was popular on that score, but he had those personal skills that are successful in democratic politics. People liked him. I’m reminded of the same political phenomenon in America in the case of Eisenhower. Eisenhower, of course, had first become a popular politician because of his victory in the Second World War. He was in command of the European theater and got all the credit or a lot of the credit for the victory, but he had these qualities that made people like him, of which trivial things can be very important. In Eisenhower’s case they liked his smile, people talked about it all the time. It turned out he was unbeatable in politics and it was a little bit like that in the case of Cimon. Even though, again, Eisenhower was not on the sort of the populous side of these things, he was after all a republican and it turned out he was pretty orthodox in that sense. Well, Cimon held to a very conservative position, as I will tell you about in just a moment, but the fact is he becomes the dominant politician in Athens. If you think of him rising to the top as early as 479 when the war is over and then we know that his period of political success in Athens ends in the year 462; that’s a seventeen-year stretch, which is a very, very long time for a politician to continue to be the leading figure in the state in Athens. Remember, an Athenian general, and it turns out that the development of the Athenian democracy was that it was the generals, who came to be the leading figures politically in the state, and the generals have to be elected every year. So think about how consistently you have to be popular with the masses in order to achieve the leadership that Cimon did. His pro-Spartan foreign policy I think is a very critical part of the tale, and I think things would have been very, very different, if Themistocles had been the dominant politician, because it was clear that from what he’d already done and what he will do later that he was anti-Spartan and urging Athenian independence from Sparta and really hostility between the two sides. Cimon — to the contrary; he was the official representative of Sparta in Athens. He had long family associations with them; he went around explaining, as I said, the virtues of the Spartans and how good it would be for Athens to emulate some of them, but more important than that, he was always in favor of a policy that had Athens and Sparta allies together, equals as they had been in his mind, in the great Persian War when fundamentally the Spartans had led and won the great victory on land at Plataea, the Athenians had led and won the victory at Salamis at sea, and the two states collaborated, cooperated, that’s how the Greeks were free from the Persian menace, and that’s how Greece would prosper and be safe in the future and it worked. Some part of the fact that the Spartans did not object to the developments in the Aegean and across the Aegean in which Athens moved from being merely the leader of the coalition to becoming an imperial power, stronger everyday. The Spartans didn’t do a thing about it in those early years. Why not? I think a major reason was because Cimon was the dominant figure in Athens. 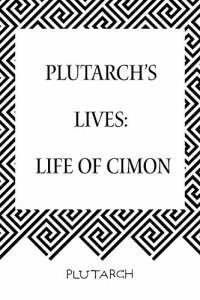 They trusted Cimon; they knew that so long as he was in that position he would not be a menace to Sparta and that they could indeed live side by side in this way. It was a stretch of time fifteen, seventeen, something like that years, which was peaceful and as I say probably would not have been without the phenomenon of the internal developments in Athens itself. Cimon also — his control of Athenian affairs by virtue of his personal standing and his persuasive abilities are also surprising. Marathon was a victory for hoplites. It was the farmers, the middling group, and those above them that had won that battle, but Salamis was a victory for the poor in Athens. Of course that vast fleet was rode by poor Athenians, and now they had the glory for the victory and, of course, after the war, when the fleet became the basis of Athenian strength and glory, it was the common man and the poorest of the Athenians, who was involved in achieving that desirable status. So, you would have thought, and if Themistocles had been in control, I’m sure he would have been right that there would be a movement towards greater democratization of the state. Remember where we are before the wars begin is Cleisthenic democracy, which is pretty much a hoplite democracy, which excludes the poor from many of the activities of the state. Cimon ran against that. He never tried to unravel Athenian democracy. He was not an enemy of Athenian democracy; he was in favor of keeping it the way it was and in some ways actually rolling back some degree of democracy. The way it was somewhat rolled back was that — and not by any legal position, legal action, but rather by sort of the way events went forward. Aristotle in the Constitution of the Athenians describes the stretch of time that I’m talking about, about 479 to 462, as the period of the Areopagites’ constitution. What that means is the old aristocratic council, consisting of former top magistrates, gained unofficial, informal, but very real power. Scholars have had a hard time understanding exactly what it was that was the nature of that power, but it looks as though a couple of elements were certainly there and they were very critical. That is, the Areopagus, it was said, sort of regained the oversight of magistrates. They were, as in the aristocratic past, in the position of being able to criticize magistrates and to take action against them, if they acted in a way that the Areopagus did not approve. 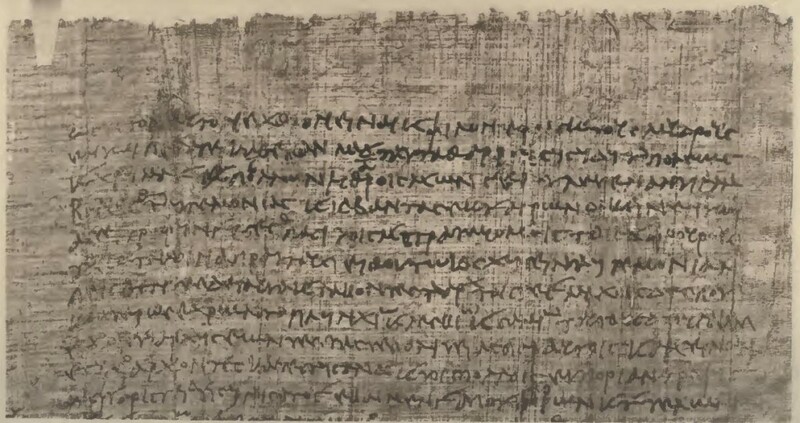 It also seems very plausible that even though there continued to be a council of five hundred, which was continuing to function as it had, ever since the Cleisthenic Constitution had established it, the fact is that more and more the Areopagus was taking decisions about foreign policy, was putting to the assembly when they desired motions, they were usurping some of the powers of the five hundred. They were not doing this, as I keep saying, by any change of the law. They were doing it, because they thought they could, and the people accepted it. 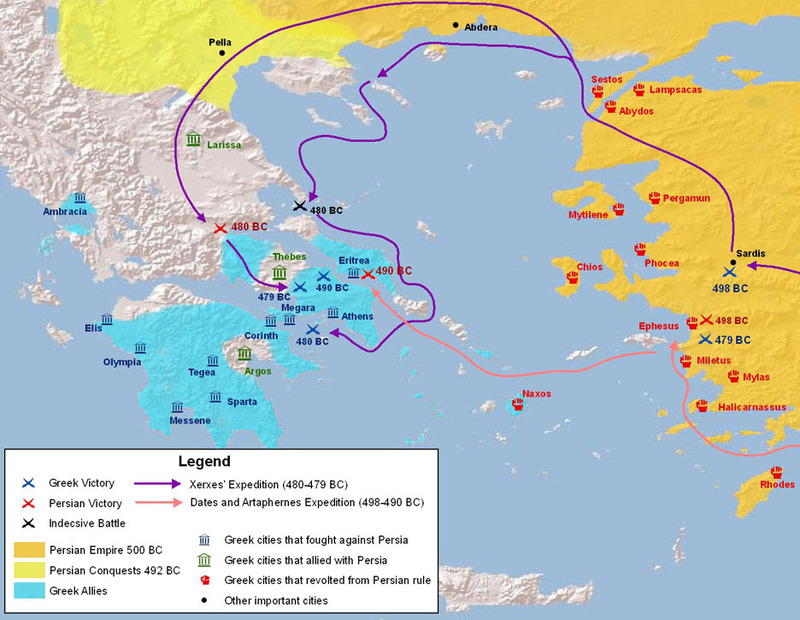 One reason for it, according to Aristotle, is that they had played a particularly heroic role in the Persian Wars at the moment when the Persians invaded Attica, and the Athenians were forced to flee their homes, and to go to Salamis, and to the Peloponnesus to escape for that moment. Now, the poor had no wherewithal to keep themselves alive when they went into exile in this way, and so the Areopagites used their own money to keep the poor alive and in good condition during that period of time. They volunteered that action, and that generosity and patriotism, and goodwill allowed the development of this Areopagite Constitution in the years that came, and that’s what Cimon I think really had in mind. He wanted to have this sort of dual policy of conservative, moderate democracy. Conservative in that it did not take any recognition of the changing circumstances that would have given the poor a better claim to political power and also conservative in the sense that it was not going to challenge the dualism of Greek international relations, as it had emerged from the Persian War, and that’s the policy that Athens followed with tremendous success during the late career of Cimon while he was at the head of affairs. Remember, I keep saying he’s at the head of affairs and he’s running things, but remember he’s just one of ten generals, who is elected every year. So all his power — it’s better to speak of his influence because it’s all unofficial. He is able to have these things happen because people do what he urges them to do, when they don’t need to. There’s no compulsion necessary; he is the one who sets the tone and they follow him. Centuries later, when Augustus becomes the boss of the Roman world, his own statement of the situation put the way he wanted people to think about it, was that he was foremost not in power, potestas is the Latin word, but rather in terms of his influence. He wanted to say it was not a tyranny, it was not a monarchy, it was a republic as it had always been and, I Augustus, as the leading citizen in the eyes of my fellow Romans am able persuade them to do these things, not because they have to, but because they want to. Well, that was his story and it wasn’t true, because he had a great big army at his back, and if you wanted to move him out of anything, you would just have to get yourself killed. This was not the situation with Cimon. Cimon could have made that speech and it would have been true. So, all that cruises along until we get to the Thasian Rebellion. Cimon is in charge of that expedition and it proves to be a much tougher problem than any that he has had to face before. The war extends for a long time; there’s no success. There’s expense and no payoff, and of course, there’s some question as to the legitimacy and decency of what is going on here. So the enemies of Cimon — in a moment I’ll tell you about them, take advantage of the discontent that the Thasian Rebellion is causing to launch an attack on Cimon politically for the first time in anybody’s memory. The opponents, these enemies of Cimon, are in the first instance a man called Ephialtes and very soon it becomes clear that he has, as a kind of a lieutenant, a younger man who was important but subordinate to Ephialtes. That young man is Pericles, the son of Xanthippus, Xanthippus the great Persian War hero. We are told — it’s very hard to disentangle the effects from the stories here, but Ephialtes was supposed to have been associated with Themistocles, and that’s very plausible because certainly Ephialtes deserves to be thought of as a democratic leader with the underlining of the democrat. He is clearly attempting to make a change in the constitution, de facto at the very least, which would allow the naval crowd, the poor people of Athens, who row in the fleets to have more political power and opportunity, and he is also very strongly anti-Spartan, so that he is opposed to both halves of the Cimonian approach to things, and he works at trying to undermine and to defeat Cimon. He had no luck at all until Thasos, and then they bring charges against Cimon. He hadn’t done anything wrong. All he had done was not win the war very quickly, but you know you make up charges in the world of politics. You’ve heard of that once or twice, and they said, well, the reason he hadn’t won the war so quickly was because had been bribed by the King of Macedonia, which is right behind the territory we’re talking about; not to conquer Macedonia. Well, guess what? He wasn’t under orders to conquer Macedonia. He had no plan to conquer Macedonia, didn’t need to be bribed not to conquer Macedonia, on top of which it would be pretty hard to bribe Cimon, because although he had started out poor from his father’s debts, he was now an enormously rich guy, because of the booty which he had legitimately acquired in his role as commander of those expeditions. 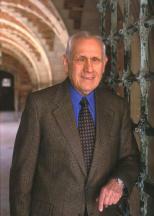 Everybody knew he was incredibly rich and he was very generous with his riches and gave it away in all sorts of ways. If you want to say that a Rockefeller is a no good, low down polecat; that’s fine. But if you want to say he’s being bribed with money all you’re going to do is get laughter out of something like that, and in some way that is the situation with Cimon. So, a trial is nonetheless launched against Cimon, the complainant is Pericles, this young up and coming democratic politician who makes the case against Cimon. He loses; of course, he loses. Cimon has not lost his support and the case is absurd. It’s just a sign that for the first time, there’s some kind of serious political opposition and who is involved in it. Even before that trial Ephialtes had tried another technique by attacking the Areopagus through a tax on particular Areopagites. If you don’t have any success in the general political arena, one device that is as old as the hills and as new as yesterday, is you try to discredit individuals in the regime that you’re trying to unseat, and so various charges were brought against, in particular, Areopagites. They have had merit; they might not. The goal was to discredit the Areopagus as a whole. Again, did not succeed in the years that I am talking about, these are just the signs of what we’re talking about, which takes us to the years just after the putting down of the Thasian Rebellion. This is an enormous argument among scholars that never will go away about just what is the date of the terrible earthquake that hit the Peloponnesus in whatever time. The most common opinion is that it was around 464 and that appeals to me too. The earthquake was so serious as to disrupt life in Sparta and in Spartan territory in general, and thereby to encourage a great helot rebellion, so that the latter even after the earthquake was over, was what occupied and terrified the Spartans, and it was serious enough that they sent out to their allies, and I’m not now talking merely about their allies in the Peloponnesian League, in their allies who had joined them in the Greek League against Persia, which was still on the books, asking them to send help against the helots, and a number of them did. It’s indicative of what the relationship between Athens and Sparta was that they also asked for help to Athens. There was a great debate in the Athenian assembly as to what answer to give the Spartans in their request for help, and Cimon of course, made the case for doing so, and in fact, he proposed that the Athenians send a very large force as these things go in the Greek world of four thousand hoplites. That’s a very big army, the Athenians very rarely sent an army of that size outside of Athens into the Peloponnesus to help the Spartans against the helots. Ephialtes spoke bitterly against that and spoke in terms of — this story is all told in Plutarch’s Life of Cimon, if you want to have a look at that. He seems to have evidence about what was said at this debate in the assembly, and Ephialtes is supposed to have said something like the arrogance of Sparta must be trampled underfoot and he lost the argument. Cimon once again won the argument. Athens sends a force of the four thousand hoplites down into the Peloponnesus. They were called on especially — The Spartans wanted them, because the helots had run away to Mount Ethoni in Mycenae, which was a fortified place on a mountain, very hard to attack. The Spartans had failed in their efforts to besiege or to storm the position there, and the Athenians had a reputation now of being very good at siege warfare, which they had gained at the end of the Persian War. As you remember, Xanthippus had besieged and taken Sestos in a very effective way. Well, the Athenians went and had a shot at it and failed, at which point, the Spartans were a little bit less keen on having them there, and then very soon after that the Spartans went to the Athenians and said, thank you very much for your contribution, we have no further need of your services, have a nice trip home. Instead of being very grateful and happy that they didn’t have to fight anymore, the Athenians were insulted. None of the other allies was asked to leave; none of the others were gone. 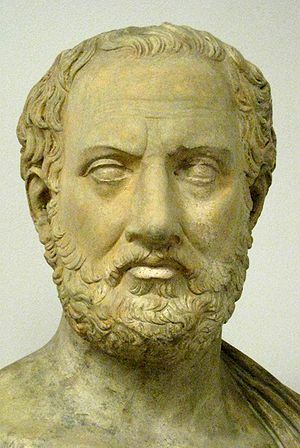 The Athenians clearly had been sent away not out of friendly reasons, and Thucydides tells us what was on the mind of the Spartans who made these decisions. They had developed a fear of the Athenian soldiers who were in the Peloponnesus. Typically, Spartans don’t get to see or know anybody else. The only time they ever get to see foreigners is if they happen to be fighting side by side briefly. But now you can imagine the scene where these ordinary everyday Athenians having been born and raised in a democracy where there was absolute freedom and freedom of speech, and where their style of life is not bad for Greeks by Greek standards, and you can imagine inviting these Athenian soldiers in for a meal and feeding them a Spartan meal, black soup and the Athenians think, this is what you give the helots, right. You’re not going to eat that stuff. You want us to eat that stuff? I wouldn’t feed it to a pig. I’m inventing the conversation, but you got the general idea, and the Spartans couldn’t have enjoyed that very much. Then as they looked around and saw what kind of state this was in which there were all these enslaved people, these vast numbers of enslaved people, not the kind of slaves they knew about, the ones who were like a handyman who assisted you on the farm — vast numbers of them doing all the work while the Spartans didn’t do any. Then they saw that business was run by a small group of people, that the average Spartan solider had nothing to say about what was going on, and being Athenians they no doubt said something about that. Thucydides says that the Spartans became fearful that they would in fact help the helots in a rebellion against the Spartans and that in general the Spartans feared their revolutionary spirit, and it was on that ground that they sent them away. In any case, there was no doubt in the minds of the Athenians, they had been sent away not in an honorable way, in which friends treat friends, but they had been dismissed. 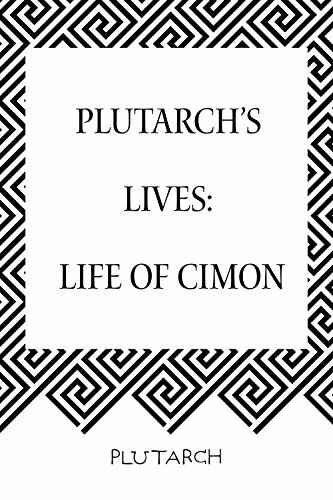 When they came home they were furious that they had gone in the first place, angry with Cimon for sending them and for, of course, his pro-Spartan position in general. In the spring of 462 — 461 is it? I think it’s 461. They ostracized Cimon and off he went. That was the deadly stroke in what was now — what could fairly be called a political revolution in Athens. It was not brought about by force; it was brought about in the constitutional way, but it nonetheless put an end to a whole stretch of time in which the state was run in a certain way and brought about a new development let us say, a development towards a fuller democracy, but it’s immediate consequences were a complete breach with Sparta. 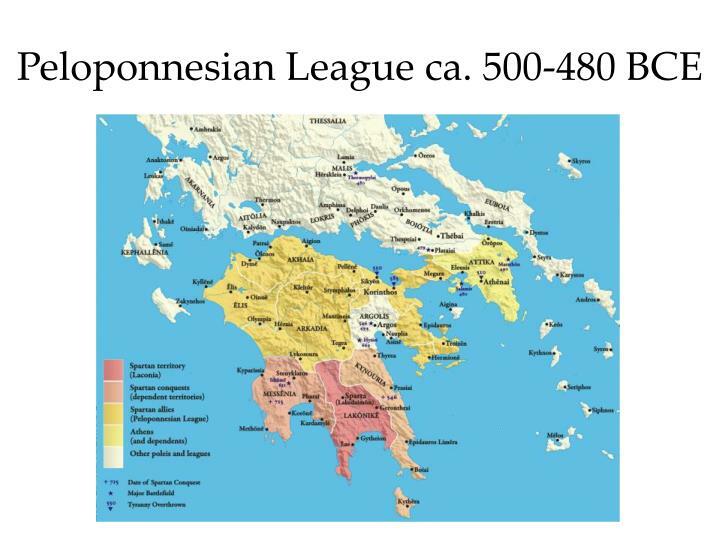 The Athenians renounced their old alliance made in the Hellenic League in 481. That was over. They turned around and made alliances with Argos, Sparta’s bitter Peloponnesian enemy. They made an alliance with people in the north, the Thessalians, who were famous for their cavalry, and the implication of that being that the Athenians had warlike intentions against the Spartans signing up, first of all, with their most famous local enemy and then signing up for the opportunity to have a cavalry to use as well, and indeed as we will see, it did lead very soon to a war between Athens and Sparta and their two sets of allies in what modern historians call the first Peloponnesian War. But before we get to that, I think we want to attend to the great changes in Athens internally that were brought about by this great revolution. I think first thing we need to do is, to dispose of Ephialtes, which is what his enemies did almost immediately. He was murdered; somebody came and stuck a knife in him. It’s very interesting; this is the only political assassination that we know of in the entire history of the Athenian democracy. When you think of how few were the methods for protecting anybody in the Athenian state, it really is a remarkable thing. Sometimes I think when you look back at the history of the United States and the number of presidents, who have either been killed or shot at, attempts made to kill them; it’s quite extraordinary that the Athenians — this is the only case we know. Nobody knows to this day who committed it; there were various rumors of which one is obviously inspired by political considerations and hard to believe, claims that Pericles killed him in order to clear the way for his own leadership of the democratic faction. I don’t think we need to take that seriously, but that was one of the charges. More likely the murder was brought about by disgruntled Cimonians, disgruntled conservatives, disgruntled aristocrats, people who were very angry at the turn of events that had changed everything in Athens. But if we look at the situation in Athens in 461, 460 and so on, we are seeing a movement towards a democratic — I don’t want to say revolution, I suppose, but a rapid movement to make the city of Athens more democratic than it ever had been. I’d like to turn next to the story of what that full blown Athenian democracy was like and how it worked. Let me just remind you that in the decade before 500, if we go back to the Cleisthenic world, the Greeks who lived in the city state called Athens established the world’s first democratic constitution. But this new kind of government was carried to its classical stage by the reforms of Pericles a half a century later in these years between 460 and 450; that’s really when most of the action took place. It was in the Athens shaped by Pericles that the greatest achievements of the Greek world took place. We should remember that the rest of the world continued to be characterized by monarchical, rigidly, hierarchical command societies, while in Athens democracy was carried as far as it would go before modern times. Perhaps, if you look at it in a certain way, further than at any other place and time and I’m going to start asking you to be aware of your prejudices and to hold them lightly, so that you can have the most full understanding of things that may have the same names, but really were very different from things that we are accustomed to. One thing that’s worth pointing out right away was in Athenian democracy the access to the political process was limited in Athens to adult males of native parentage. Athenian citizenship granted full and active participation in every decision of the state without regard to the wealth or the class of the citizen. In the 450s, under Pericles leadership, the Athenian assembly passed a series of laws that went far towards establishing a constitution that was as thoroughly democratic as the world has ever seen. It gave direct and ultimate power to the citizens in the assembly and in the popular law courts where the people made all decisions by a simple majority vote, and it provided for the selection of most public offices by allotment for the direct election of a very special few and for short terms of office and close control over all public officials. We need to have a clear understanding of the kind of regime Pericles reforms produced. For I don’t think it’s easy for citizens of what are called democracies in the twentieth century, twenty-first century, to comprehend the character of the democracy of ancient Athens and the role that it played in the life of its citizens. 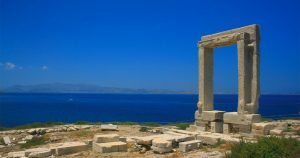 To a degree that’s hard for us to grasp, politics was primary in the ancient Greek city and the form of the constitution was understood and expected to shape the character of its citizens. 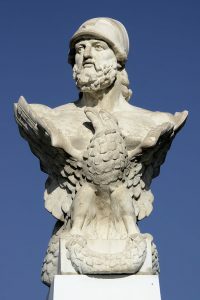 The art, the literature, the philosophy, and all the great achievements of Periclean in Athens cannot be fully understood, apart from their political and constitutional context, in the democracy established by Cleisthenes and then extended by Pericles later. I think a place to start with a description of the Athenian democracy is with some attempt at a definition of the term. Developments in the modern world make that really hard, for the word has become debased and is almost meaningless. Few modern states will admit to being anything but democratic. That is confusing enough, but there are further complications. Many people today would insist that to qualify as a democracy, a state must offer full constitutional and political protections and opportunities to all who have legal permanent residence within its borders and who desire citizenship. But the Athenians limited the right to vote, to hold office, to serve on juries to adult males who were citizens. Slaves, resident aliens, women, and male citizens under the age of twenty were denied all these privileges. 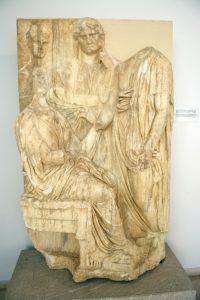 Modern critics of ancient Athens question the democratic character of the Periclean regime, because of the presence of slavery and the exclusion of women from political life. In excluding such groups, the Athenians were like every other society since the invention of civilization about 3000 B.C. until just recently. So, it’s really not too interesting or amazing to point out this shortcoming from our point of view. What sets the Athenians apart, are not these exclusions, but the unusually large degree of inclusion as well as the extraordinarily significant and rewarding participation of those who were included. It’s useful to remember that what has been called the Jacksonian Democracy in the United States coexisted with slavery in its fullest moments — that women were everywhere denied the right to vote until the twentieth century, and that we continued to limit political participation to those of a specified age. To deny the title of democracy to Pericles in Athens, because of those excluded would be to employ a parochial and an anachronistic set of criteria that produced paradoxical results. Certainly no contemporary Greek doubted that Athens was a democracy. The only argument was whether a democracy was good or bad, which is almost an unthinkable question to put in our time. To look at it from the other end, the Athenians would have been astonished at the claim of modern states to that title, even such states as the United States and Great Britain. For, to them, an essential feature of democracy was the direct and full sovereignty of the majority of citizens. Government by elected representatives, checks and balances, separation of powers, appointment to important offices, unelected bureaucracies, judicial life tenure, terms for elective office of more than one year, all of these would have seen clear and deadly enemies of what reasonable people might understand by democracy. 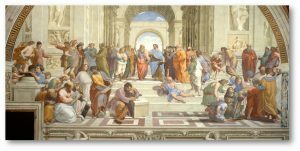 So, these differences between ancient and modern ideas require a brief examination of how the Athenian democracy worked, if we are to shed our prejudices and grasp the character of a form of government that is as rare as any in the history of the world, and that probably never existed in anything like the same form after the end of Athenian autonomy. So I like to use a helpful, if an anachronistic advice by considering the three familiar branches into which we divide government: legislative, executive, and judiciary. 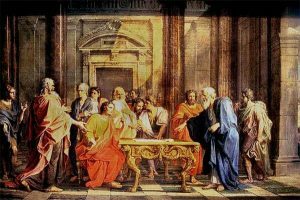 At the heart of what we would call the legislative branch of the Athenian democracy was the assembly; their word was ecclesia. It was open to all the adult male citizens of Athens, during Pericles lifetime; these may have been 40,000 possibly as many as 50,000 men. 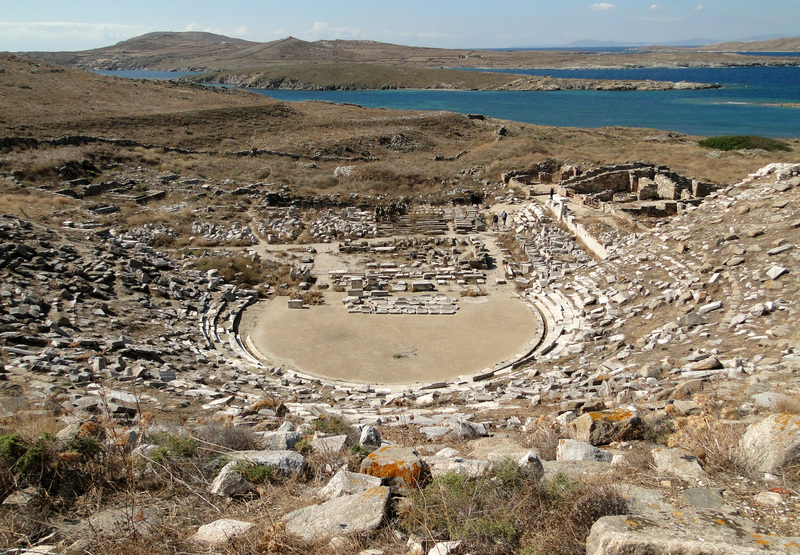 Now, most Athenians lived many miles from the city. Few owned horses; so attendance required a very long walk to town. So as a result, the number taking part normally was well short of that. It was probably from 5,000 to 6,000 people. One reason for saying that is there was a quorum for some actions that you had to have at 6,000 votes. On the one hand that tells us, I think, that there were probably more than that who attended the assembly. You wouldn’t make a quorum being everybody who ever attended the place, but on the other hand, it suggests that were many assemblies with fewer than 6,000 votes. 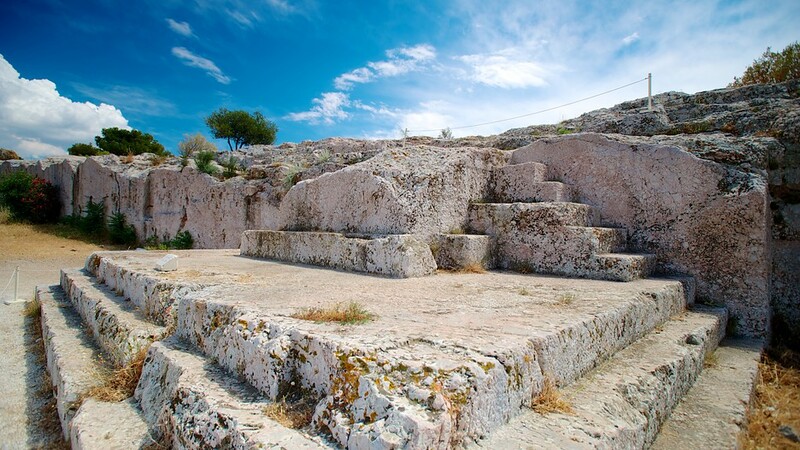 The meetings took place outside, on a hill called the Pnyx, not far from the Acropolis and overlooking the agora. Citizens sat on the earth of this sharply sloping hill and the speakers stood on a low platform. It was not easy for them to make themselves heard. You can imagine, it’s an outdoor place; they don’t have microphones. 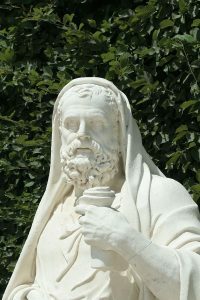 The great fourth century orators are said to have practiced — well, Demosthenes, the greatest of them, was said to have practices speaking at the seashore over the crashing surf to make his voice strong enough to be heard on the Pnyx. A good loud voice was really a terrific asset for an Athenian politician. You get some idea of the opening of these meetings from a comic version that is given to us in Aristophanes’ comedy, Acharnians, performed in the year 425. The speaker is a typical aristophanic comic hero, an old fashioned farmer from the back woods who complains about the war, the war is now about six years old, because it keeps him in Athens, away from his farm in the country. I quote now from the aristophanic passage, “it is the day of an assembly,” he says — by the way, he’s sitting there all by himself on the Pnyx, nobody has come yet, and there he is complaining. “It is the day of an assembly and already morning, but the Pnyx is deserted. They are chattering in the agora, dodging the rope dripping with red dye” — that’s a reference to the fact the Athenians were always slow to come from the marketplace, the agora, the city center and make it up the hill to the Pynx, because they were so busy talking that they just wouldn’t get going. So, the officials had some guys carrying a rope dipped in red dye. They circle the agora, and they kept closing the circle until everybody was out. You would be running from them in the first place, because you wouldn’t want to get your coat full of red dye, and so that’s what he’s referring to. “So, I have come here fully prepared to shout, to interrupt, to abuse the speakers, if they talk about anything but peace, but here come these noon-time presidents. Didn’t I tell you? Didn’t I predict how they would come? Everyone jostling up to the front seat. Next, the herald of the assembly says, move up, move up within the consecrated area, and then he recites the formula that regularly begins debate in the assembly. He simply says, ‘Who wishes to speak? '” At which somebody raises a hand and the game gets started. Okay, that’s the comic version; but the real meanings on the Pynx were rarely comic. They dealt with serious questions. The assembly had four fixed meetings in each of the ten periods, into which the official year was divided, and also special additional meetings were called for when necessary. Topics included the approval or disapproval of treaties, making declarations of war, assigning generals to campaigns, deciding what forces and resources they should command, confirming officials or removing them from office, deciding whether or to not hold an ostracism, questions concerning religion, questions of inheritance, in fact, anything else that anybody wanted to bring up in the assembly. It’s especially amazing for a citizen of a modern representative democracy to read of these great town meetings dealing directly with questions of foreign policy that could mean life or death for those present at the debate and for their entire city. To get some idea of the distance between ancient and modern democracy, we need only to consider how an emergency, say the seizure of an American embassy, would be dealt with today in the United States. It probably arrived first as secret information at some bureau of the government’s vast and complex intelligence service, although it could also just show up on CNN before the government knows. But it would be treated as highly confidential and revealed only to a few people in the White House, the state, and defense departments. Policy would be discussed in a small closed group and the decision made by one man ultimately, the President of the United States. If there were no leaks, a big if, people would hear of it only when the die had been cast. A model for those of my vintage was the Cuban Missile Crisis, which was kept as a great secret. In those days the press actually would keep secrets on behalf of the national security. Can you imagine such an old fashioned approach? Then they had been kicking it around for a week when the President got on television and told us what the menace was and what he was doing about it. It was too late to have any discussion or argument about, but that’s the way it works in our system. Questions of war and peace rose more than once in Periclean Athens and each time the popular assembly had a full debate, and made the decision by raising their hands in a vote determined by a simple majority. I don’t think there’s any stronger evidence of the full and final sovereignty of the Athenian people on the most important questions than the fact that that is the way they made those decisions. An assembly of thousands of course could not do its business without help. For that it relied on the council of five hundred chosen by lot from all Athenian citizens. Although it performed many public functions that the larger body could not handle efficiently, its main responsibility was to prepare legislation for consideration by the people. In this respect, as in all others, the council was the servant of the assembly. The assembly could vote down a bill drafted by the council, they could change it on the floor, they could send it back with instructions for redrafting, or they could replace it with an entirely different bill. Full sovereignty and a real exercise of public authority rested directly with the assembly. Almost no constitutional barrier prevented a majority of the citizens, assembled on the Pynx, on a particular day from doing anything they wanted to do. Plaster cast bust of Thucydides, Athenian general and historian / Pushkin Museum. Turning to the executive, as what we would call the executive, these distinctions did not exist for the Athenians. They didn’t make these divisions, but to help us understand it I’m using these terms. What we might call the executive was severely limited in extent, in discretion, and power. The distinction between legislative and judicial authority was far less clear than in our own society. To begin with, there was no president, no prime minister, no cabinet; there was not any elected official responsible for the management of the state in general for formulating or proposing a general policy. Nothing that Americans would call an administration or that the British would call a government. The chief elected officials were ten generals, voted for a one year term. As their title indicated, they were basically military officials, who commanded the army and the navy. They could be reelected without limit and extraordinary men like Cimon and Pericles were elected almost every year, but they were very exceptional. The political power such men exercised was limited to their personal ability to persuade their fellow citizens in the assembly to follow their advice. They had no special political or civil authority, and except on military and naval campaigns, they couldn’t give orders to anybody. Even in military matters the powers of the generals were severely limited. Leaders of expeditions were selected by vote of the full Athenian assembly, which also determined the size of the force and what goals it should pursue. Before the generals took office they were subjected to a scrutiny of their qualifications by the council of five hundred. After completing their year of service, their performance on the job, and especially their financial accounts were subject to audit in a special process called euthuna. Nor was this the only control by the people over the few officials chosen by election. Ten times a year the popular assembly voted to determine whether the general’s conduct of military affairs appears satisfactory, and if the people vote against someone’s confirmation in office, he is tried in a law court. If he is found guilty they assess his punishment or fine. If he is acquitted, he resumes office. Since elected office conferred prestige, elected officials were carefully controlled, rather, lest they should undermine the rule of the people. That’s what’s behind all of this careful check on the generals. Even with these severe controls, the Athenians fulfilled only a few public offices by election. Choosing their military officials, their naval architects, and only some of their treasurers, as well as the superintendent of the city water supply in that manner; all other officials, and there were a good number of them, were chosen by lot. Allotment was the characteristic device by which the Athenians chose their officials, in accordance with the dominant democratic principle, which was equality, which held that any citizen who is capable of performing civil responsibilities well enough, and it’s corollary that feared allowing executive or administrative power to fall into the hands of a few men, even those who were experienced, or had special abilities. 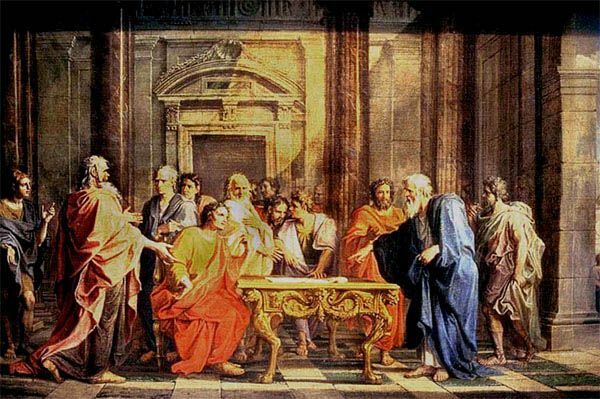 For these reasons, the Athenians filled the bulk of their offices by lot and limited tenure to one term per man in each office except for the council of five hundred, where a man could serve twice in the course of his life. Generals, however, could be reelected forever, because it was so obvious that issues of skill and ability were literally vital in that job and so that was the one real exception to being limited to a very short term. 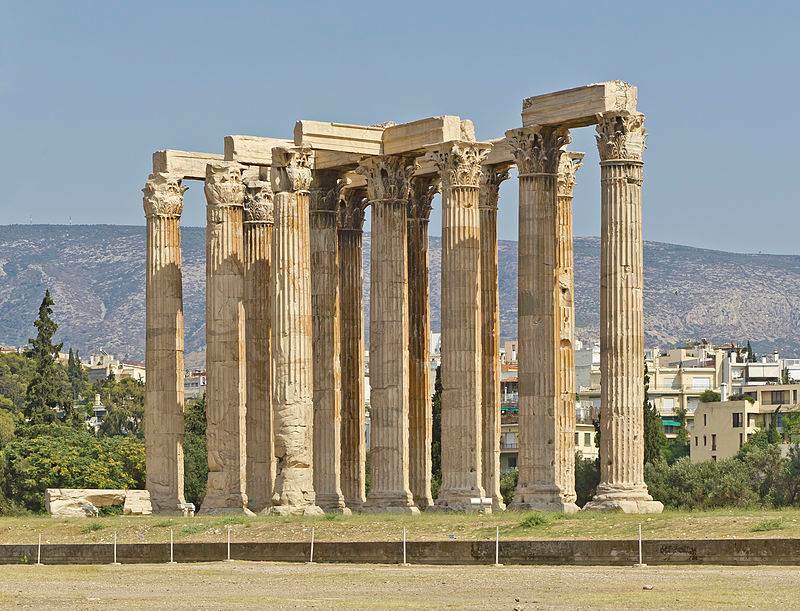 To a degree that is amazing to the modern mind, the Athenians kept the management of their public life in the hands of ordinary citizens, away from professors, professionals, experts, bureaucrats, and politicians. 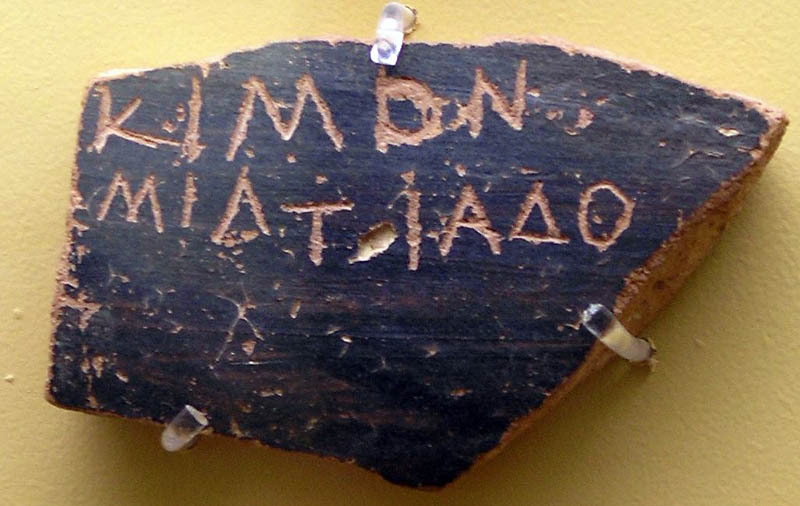 Fragment of allotment device (kleroterion) used for random jury selection, Greece, third century BCE. A number of black and white balls were dropped into a funnel and the order in which they exited an attached tube determined which horizontal row of potential jurors would serve in a given trial. / American School of Classical Studies in Athens. Now I’d like to turn to what we would call the judicial branch. Now, this Athenian judicial system, I think, might seem even more strange to the modern eye than the rest of the constitution. You start with this panel of six 6,000 jurors who enlisted to serve in the courts each year. On any given day, the jurors who showed up to accept an assignment were assigned to specific courts and to specific cases. The usual size of a jury seems to have been 501, although there were juries as small as fifty-one to as many as 1,501, depending on what the case was, whether it was public or private, and also how important it was. 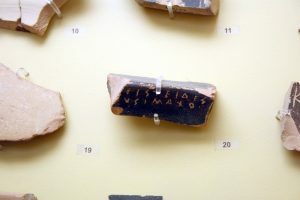 To avoid any possibility of bribery or partiality, the Athenians evolved an astonishingly complicated system of assignments that effectively prevented tampering. That system is described in Aristotle’s Constitution of Athens. I think it’s chapter 61; if any of you think that you have about a month or two to spare, read that paragraph and tell me what the hell it means, how it works. It’s so complicated and the point is that they wanted to be sure that it was just impossible for anybody to know who was going to be on a particular jury panel for a particular case so that if you wanted to bribe anybody you’d have to bribe 6,000 people and that might be mildly discouraging. You might say that’s an honest bunch of people. Well, you don’t devise such a complicated system if everybody isn’t busily thinking of a way to cheat, it seems to me. However, they would have failed, the system certainly was full proof I think. Legal procedure was remarkably different from what takes place in a modern American court. The first surprise you would meet is the absence of any public prosecutor or state’s attorney. In fact, there are no lawyers at all. Think of that. Think of how happy that would make Shakespeare. Complaints, whether they were civil or criminal, public or private, large or small, were registered and argued by private citizens. 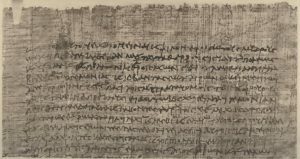 Plaintiff and defendant, suer and sued, each made his case in his own voice, if not in his own language, because anyone was free to hire a speech writer to help him prepare his case and that profession flourished in Athens. Although it reached its peak only many years after the days of Pericles, the greatest writers of courtroom speeches that have been preserved, and I believe they were preserved because generations thought they were the very best speeches there were, come from the next century, from the fourth century B.C. Here’s another surprise. There is no judge. The jury was everything. No self respecting Athenian democrat would allow some individual, whatever his qualifications, to tell him what was relevant evidence and what was not, or which laws or which precedence applied. From the Athenian point of view, that would give too much weight to learning and to expertise, and it would also create the danger of corruption and undemocratic prejudice. I mean, if you couldn’t conceal who the judge was going to be as you could the jurors, you could — if there was a judge and he was important, you might be able to bribe him. Indeed, in our own system it is not unheard of that judges are bribed. It’s not even unheard of that they were unduly prejudiced in one direction or another. The Athenians would have none of that. So, it was up to the contestants in the case to cite the relevant laws and precedence, and it was up to the jurors to decide between the plaintiff and the defendant. So, in fundamental matters of justice and fairness, the Athenian democrat put very little faith in experts. This was one of the most democratic aspects of this democratic constitution, the assumption that all citizens had enough sense and enough of whatever else it took to make the judgments that were so important in the courts. In the courtroom, the plaintiff and defendant each had an opportunity to present his case, also to rebut his opponent, to cite what was thought to be the relevant law, to produce witnesses, and then to sum up his case. Now, here’s another amazing thing from an American perspective, each case — I’m sorry, each phase in the case was limited to a specific amount of time, which was kept by an official using a water clock, and no trial, get this, lasted more than a single day. Finally, the case went to the jury, which, of course, received no charge or instruction since there was no judge to tell them what they had to think about and what possibilities were available. The jury did not deliberate; you didn’t have 1,501 angry men. They just voted by secret ballot and a simple majority decided the issue. If a penalty was called for, and it was not one that was described by law and very few penalties were described by law, the following procedure was used: the plaintiff who had won the case proposed a penalty, the defendant then had the opportunity to propose a different penalty. The jury then, again no deliberation, just voted to choose one or the other, but they could not propose anything of their own; no creative penalties were possible, just one or the other of the ones proposed by each side. Normally, this process led both sides, if you think about it, to suggest moderate penalties. For the jury would be put off by an unreasonable suggestion one way or another. If the plaintiff asked for too heavy a penalty that would guarantee they would take the other guy’s penalty and vice versa. Critics of this system complained that democracy made the Athenians litigious. The system contained a device therefore — well, not therefore but as a matter of fact, in contradiction to that — Let me back up. Of course, the Athenians were litigious and knowing that they built in an element meant to reduce the degree of unfounded, unreasonable, silly, or just terrible accusations. The system contained this device. If the plaintiff did not win a stated percentage of the jurors’ votes, then he was required to pay a considerable fine. In public prosecutions he paid it to the state. In private prosecutions he paid it to the defendant. Surely, this must have served as a significant deterrent for frivolous, malevolent, and merely adventurous suits. Just think of how it would change our system if we had something like that. In a way, we do have some of it available in our system. It is possible, for instance, if somebody brings a suit against somebody else and fails, it is possible for the judge to decide that the defeated side must pay court costs which is a form of defense against the frivolous charges. But it isn’t anything as thorough as the Athenian system, which always had that around. So, if you had a case that wasn’t going to win many friends on the jury it was going to cost you one way or another. Well, this Athenian system of justice had many flaws obviously. Decisions could be quirky and unpredictable since they were unchecked by precedent. Juries could be prejudiced and the jurors had no defense except their own intelligence and knowledge against speakers, who cited laws incorrectly and who distorted history and we have speeches in law courts in which these guys are making up laws that nobody ever heard of and that they are making arguments that are terrible. So, that they did abuse this opportunity, there’s no question about it. Speeches unhampered by rules of evidence and relevance, and without the discipline imposed by judges could be fanciful, false, and sophistical. So, of course, all of these flaws were there, yet from a modern perspective I would argue that the Athenian system had a number of attractions. The American legal system and court procedures have been blamed for excessive technicality verging on incomprehensibility and for the central role of lawyers and judges which give an enormous advantage to the rich who can afford to pay the burgeoning costs of participating in the legal system. The absence typically of a sufficient deterrent to unfounded lawsuits has helped to crowd court calendars. Time spent in jury selection, which didn’t take any time at all of course in Athens, and wrangling over legal technicalities stretches out still further, a process that has no time limit. It is not uncommon for participants in a lawsuit to wait for many years before coming to trial. Sometimes the plaintiff has died before his case gets to court. Not everyone is convinced that the gain in the scrupulous protection of the participant’s rights in an increasingly complex code of legal procedure is worth the resulting delay, and some point to the principle that justice delayed is justice denied. Often, in our courts, decisions are made by judges on very remote, difficult, legal or procedural grounds that are incomprehensible to the ordinary citizen. As a result, there is much criticism of judges and lawyers, and a loss of faith in general in the legal system. 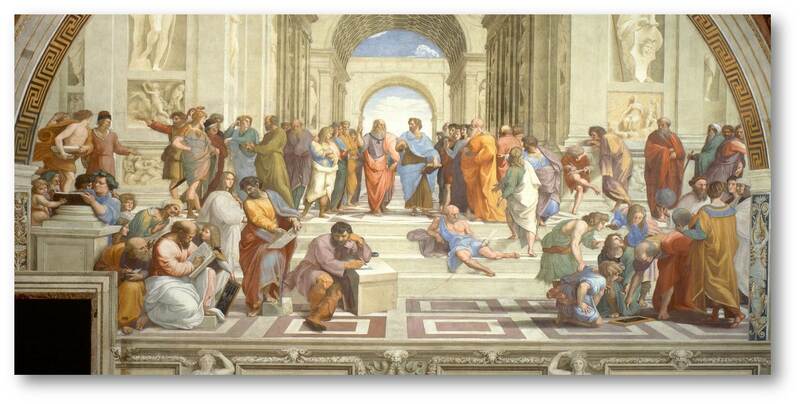 For all its flaws, I think the Athenian system was simple, speedy, open, and very easily understood by its citizens. It did contain provisions aimed at producing moderate penalties and at deterring unreasonable lawsuits. It placed no barriers of legal technicalities or legal experts between the citizens and their laws, counting as always on the common sense of the ordinary Athenian. Now the Athenian democratic system as a whole, brought to its height in the time of Pericles, has been harshly criticized through the ages immediately by contemporaries, who were hostile to the democracy, and through the centuries by people who have looked at Athenian history as it was depicted by the surviving authors and concluded harsh conclusions about democracy. Ancient writers directed most of their attacks against the idea of government by mass meeting and the selection of public officials by allotment. 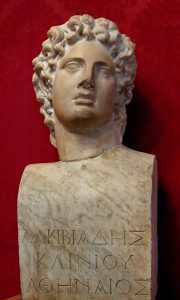 The Athenian renegade Alcibiades told a Spartan audience, as for democracy nothing new can be said about it, an acknowledged foolishness. Plato has Socrates make the same point more fully and seriously. Socrates observes that when it is a matter of building a house or a ship the Athenian assembly listens only to experts. If someone without expert qualifications tries to give advice in such things, even if he is very handsome and rich, and noble they refuse to listen to him. Instead they laugh and hoot at him until either he is shouted down and withdraws of his own accord, or the sergeants at arms drag him off, or he is expelled by order of the presidents. 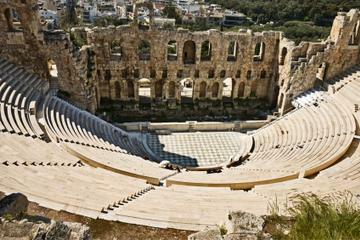 So, just imagine that when you get up to speak in the Athenian assembly, you better be ready for anything. 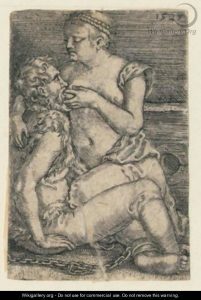 But when the discussion is about affairs of state says Socrates, anyone can get up to speak, carpenter, tinker, cobbler, passenger, ship owner, rich and poor, noble and commoner, and nobody rebukes him as they did in the earlier case; for trying to give advice when he has no knowledge and has not been taught. Now in fact the Athenians did appreciate the importance of knowledge, skill, talent, and experience, when they thought these things existed and could be used in the public interest. So, they did not allot, but elected military officers, some treasurers, naval architects, and managers of the water supply. These are essentially questions of life and death, or of the financial security of the state; apart from that they did not care much about expertise. If they did not elect professors of political science or philosophers, or lawyers to govern and judge them, it was because they were skeptical that there is a useful expertise in these areas, and that if it did exist it could safely and profitably be employed for the public good. It is not clear, to me anyway, that the experience of the last twenty five hundred years has shown them to be wrong. I don’t know what percentage of the representatives and senators in our Congress are lawyers by training, but whatever that figure is, it’s far too large. It’s really extraordinary that we all sit still for that kind of thing. The kind of variety of profession that one can find in our society is absolutely not to be seen in our government institutions. Well the Athenians would never permit anything so undemocratic as that. Secondly, it is most unlikely that many fools or incompetents played a significant part in public affairs. Of course, that’s the flip side of rejecting expertise and experience; you may end up with people who don’t know what they’re talking about in any shape, manner, or form having influence. Well the Athenians knew that and they were worried the fact that there was a possibility of idiots, fools, jerks, and other unworthies dominating the political decisions. I don’t think that it’s clear that we are better off than they are in this respect. I remember William Buckley once said, he would rather be ruled, governed by the first forty or whatever he said forty-fifty people in the Boston Telephone Directory, than by the Harvard faculty. I thought we could all agree with that, maybe even the Yale faculty. I think that we ought to think a little bit longer before we assume our system is the only way one can think about conducting a democracy. But to get at how the Athenians coped with this problem the assembly itself was a far less unwieldy or incompetent body than is generally assumed by its critics and that you might ordinarily think would be the case if you’ve got five or six thousand people out there trying to make a decision. Think of this, if an Athenian citizen attended no more than half the minimum number of sessions held each year, he would hear twenty sets of debates by the ablest people in the state, chiefly, elected officials or those who formerly had held elective office, the leading politicians in all factions, and a considerable number of experts on a variety of subjects who would simply get up and express their views. These were true debates in which it was not possible to hold prepared remarks and look at your — what do they call these books that they use? Their policy books or whatever; they were real debates and the speakers had to respond extemporaneously to difficult questions and arguments from the opposition, nor were they irresponsible displays, but serious controversies leading immediately to votes that had important consequences for the orators and their audiences. Now if you assume that each attendant at the assembly had been listening to such discussions for an average of only ten years, and many of them would have had a much longer stretch, think of it, such experiences alone must have fashioned a remarkable body of voters. Probably, I would argue, more enlightened and sophisticated than any comparable group in history. Apart from that, every year five hundred Athenians served on the council, where everyday they gained experience in the management of Athens affairs from the most trivial to the most serious, producing bills that served as the basis for the debates and votes of the assembly. So, in any particular assembly thousands of those attending, perhaps a majority of them would have had that kind of training on the council. In light of that breadth of experience, the notion that decisions were made by an ignorant multitude is simply not persuasive. I like to compare that situation with something that I think perhaps we can understand. In the nineteenth century, when people went to a concert of what we call classical music, almost everybody in the audience was a musician of some kind. Before radio, television, recording systems, if you wanted music you had to play it and so people, especially women but men too, studied how to play various instruments and they could. So, they could read music and they could understand it in a way that only a participant can. Hardly anybody who goes to a concert today is in that situation. So, Beethoven and Brahms and people like that wrote their compositions and orchestras and so on and they played to people who were in a certain sense almost experts, in any case, very well educated amateurs. That’s the analogy I would suggest that we’re talking about that. A professional politician so to speak, insofar as there were any in Athens, we’re dealing with people who didn’t just come in off the street and didn’t know anything about it. They were prepared by their life’s experience to be a very, very tough audience indeed. But that raises the question, were debates in the assembly carried on by ordinary citizens without the necessary special knowledge and capacity for informed advice? The evidence, I think, suggests not. For there were impressive deterrents, both formal and informal, that would make an inexperienced, ill informed, poorly educated man reluctant to speak up in the assembly or the council even. To begin with I would suggest another analogy for you. For the many, many years I have attended meetings of faculties at great American universities, what I have seen is that very few and generally the same few are bold enough to speak for or against some not very controversial policy argued in a group of fewer than hundred people, not to mention those rare, larger meetings when subjects arousing passions are at issue. Now the people we’re talking about, these faculty meetings, have extraordinary educations, they are alleged to have unusual intellectual ability, and they belong to a profession where public speaking is part of the trade. The meetings are conducted in the decorum of established rules of order that forbid interruptions and personal attack. If a guy wants to say that man is a goddamn liar, somebody will call him to account and say that was a violation of personal privilege and you should cut it out. That’s not the way it happened in the Athenian assembly. Yet, even at these very, very gentile faculty meetings I’m talking about, those who attend them speak very rarely if ever. Why? What is that deters them? People really are afraid of looking stupid. They’re just afraid that even if nobody even tells them they’re stupid, just the way they react may make them feel as though they are stupid. This is a fantastic deterrent and if we don’t understand that we will not understand the way the Athenian assembly worked, because that — but of course you know perfectly well their problem was much greater. 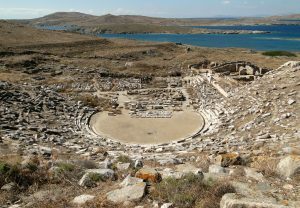 Meetings of the Athenian assembly were not quiet, seemly occasions. 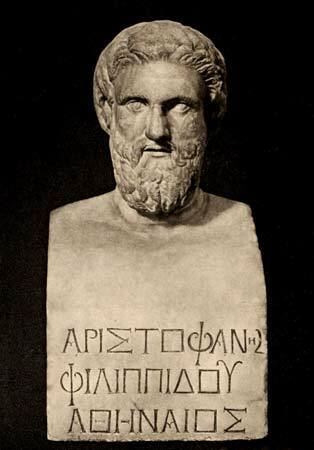 We should not forget what Dekaioplis said in Aristophanes plays, sitting there on the Pynx, he threatened to shout, to interrupt, to abuse the speakers. We shouldn’t forget Plato’s report of how the Athenians laughed and hooted, or shouted down speakers who lacked what they thought was the necessary expertise. Now, these informal deterrents alone, I believe, sharply limited the number of speakers in the assembly, but there was also a formal device that encouraged them to take thought before they intervened and to be careful in what they said in these debates on the Pynx. 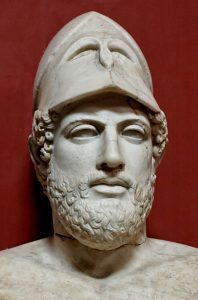 At some time, perhaps during the career of Pericles, but certainly not more than fifteen years after his death the Athenians introduced a procedure called the grafe para nomo that had the effect of making the citizens in the assembly the guardians of the constitution. Any citizen could object to a proposal made in the council or in the assembly simply by asserting that if contradicted an existing law. That assertion stopped action on the proposal or suspended its enactment, if it had already been passed. The proposer was then taken before a popular court and if the jury decided against him, his proposal was disallowed and he was fined. Three findings that a person had done this, deprived him of his rights as a citizen. The expectation of the assembly and its procedures, formal and informal, made it most unlikely that ignorance and incompetence played a very significant role in its deliberations. Of course, there are some ignorant imbeciles who nothing will deter, but that’s true of our system too. An even graver charge has been leveled through the ages against the kind of democracy promoted by Pericles. It is said to be inherently unstable, inviting faction and class warfare. It is said to be careless of the rights of property and to result in the rule of the poor, who are the majority over the rich minority. These arguments weighed very heavily in the thinking of the founding fathers of the American Constitution, who rejected democracy. You need to be aware of that. Their notion of what democracy was Athenian democracy as described by its critics and they consciously and plainly rejected democracy. They thought something else, they thought they were creating a popular republic, and by republic they meant something different from democracy. Starting with the fuller democracy, instituted by Ephialtes and Pericles, in fact, we discover an almost unbroken orderly regime that lasted for a hundred and forty years. Twice it was interrupted by oligarchic episodes. The first resulted from aa coup d’état in the midst of a long and difficult war. The government of that oligarchy lasted just four months. The second was imposed by the Spartans after they won the Peloponnesian War that one lasted less than a year. On each occasion, the full democracy was restored without turmoil, without class warfare, without killings or exiles or revenge, without confiscating the property of anybody. 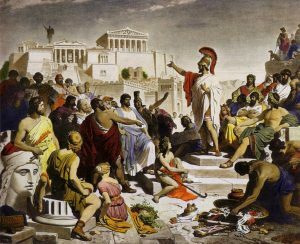 Through many years of hard warfare, military defeat, foreign occupation, and oligarchic agitation, the Athenian democracy persisted and showed a restraint and a moderation rarely equaled by any regime. Now this behavior is all the more remarkable in light of the political and constitutional conditions that prevailed in the Periclean democracy and thereafter. Remember that the mass of Athenians were not faced with the power of what has been called a military industrial complex. They were not thwarted by the complexities of representative government by checks and balances, by the machinations of unscrupulous lobbyists, or manipulated by the irresistible deceptions of mass media. They had only to walk up to the Pynx on assembly day, make speeches, and vote in order to bring about the most radical, social and economic changes. They could, if they had wanted to, they could have abolished debt which presumably would be something the poor would favor. They could institute confiscatory taxation of the rich to the advantage of the poor. The simple expropriation of the wealthy few, all of these things they simply could have done, nothing would have stopped them but they never did. Although political equality, that is to say, equality before the law, that was a fundamental principle of democracy, but economic equality had no place in the Athens of Pericles. On the contrary, the democracy he led defended the right of private property and made no effort to change its unequal distributions. The oath taken by jurors each time that they sat on a jury included the following clause. “I will not allow private debts to be canceled, nor lands or houses belonging to Athenian citizens to be redistributed.” In addition, the chief magistrate each year swore that whatever anyone owns before I enter this office, he will have and hold the same, until I leave it. 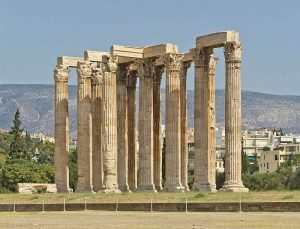 The Athenians respect for property and their refusal to insist on economic equality go a long way towards explaining why their democracy was so peaceful, so stable, and so durable. But why were the majority of citizens so restrained and moderate? 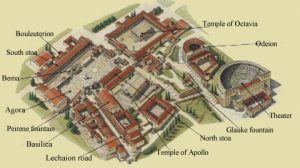 Part of the answer lies in the relatively broad distribution of property in fifth century Athens. It was by no means equal. I want to emphasize the word “relatively” compared to states that were oligarchical or aristocratic. Also, in its growing prosperity, through the greater part of that time, it’s very hard to sustain any kind of a reasonable, moderate regime in times that are hard, in times in which there is great poverty so that was – these were certainly among the reasons why Athens was so successful. But there was always, you should remember, a group of fabulously wealthy citizens and also thousands who were poor by any standard. It certainly seems clear that at any time in this period the majority of Athenian citizens were not rich enough to be hoplites. Not rich enough even to have those small family farms that supported your infantrymen. So, it’s not as though there aren’t a lot of poor people in the state. The poorest, moreover, those who lacked the property to quality as infantrymen, were the very men who rode the ships that brought Athens wealth and power and glory. The last 30 years of the century furthermore were terrible times of war, plague, impoverishment, and defeat. Yet neither during nor after the war did the Athenian masses interfere, in any way, with private property or seek economic leveling in the two ways the revolutionaries always wanted it, canceling debts and redistributing the land. 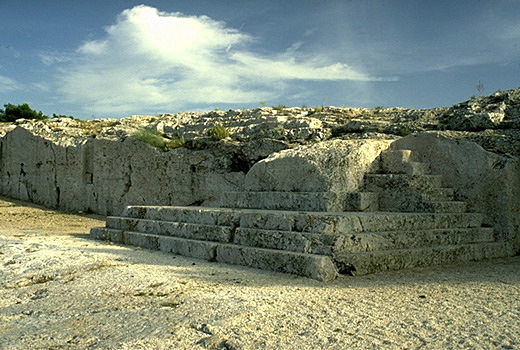 In the Periclean democracy, the Athenian citizens demanded only equality before the law. I think that is the key principle to understand when you’re thinking about Athenian democracy. Full political rights for all citizens, and that is what separated the Athenian democracy from oligarchies and aristocracies in other Greek states, and the kind of even chance that is provided by these two things, equality before the law and participation in the political process for all citizens. By these rules, the Athenian was willing to abide in the face of the greatest disasters and the greatest temptations. It was this politically equal, individualistic law abiding, and tolerant understanding of the democracy that Pericles had done so much to create and to which he could appeal, and point with pride confident that his fellow citizens shared his views. In their rational, secular, worldly approach to life, in their commitment to political freedom, and to the autonomous importance of the individual in a constitutional republican and democratic public life, the Athenians of Pericles day were closer to the dominant ideas and values of our own era than any culture that has appeared to the world since antiquity. That is why Periclean Athens, I believe, has so much meaning for us. But if there is much to learn from the similarities, there’s at least as much to learn from the differences between the Athenians and ourselves. 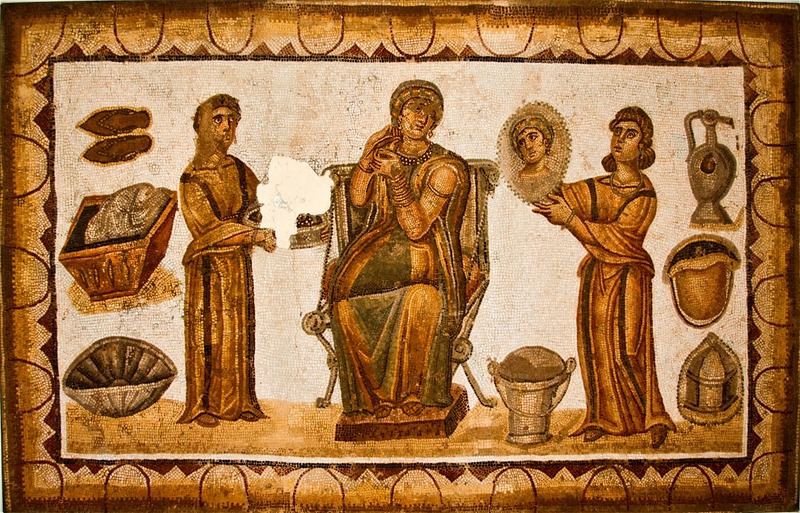 Although the Athenians value wealth and material goods as we do, they regarded economic life and status, both as less noble and less important than participation and distinction in public service to the community. Although they were pioneers in recognizing the importance, the autonomy, and legitimate claims of the individual, they could not image the fulfillment of the individual’s spiritual needs apart from his involvement in the life of a well ordered political community. To understand the achievement of Pericles and his contemporaries, we thus need to be aware of these significant differences. I think we ought to also study them with a certain humility. For in spite of their antiquity, the ancient Athenians may have known and believed things we have either forgotten or never known, and we ought to keep open the possibility that in some respects they might have been right about some of these things. Now what I’ve been talking about up to now is the workings of the Athenian Constitution for active citizens, and I remind you, that means free men, adults, who have citizen parents. That excludes a lot of people, who lived in Athens and so I’d like to spend a little time also talking about two groups of such people, who were excluded from the political process: women and slaves, both of which have caught the attention of modern scholars eager to demonstrate the undemocratic aspects of ancient Athens when judged by our criteria, which seem more and more to require that every living creature — I was going to say every living thing be treated with equality. I know that of course there are feelings that people who wanted to say that — we all say, we all agree there should be no discrimination between men and women. There, of course, should be no slaves, but now we’re moving towards saying that people should receive citizenship or citizen rights who aren’t even legally citizens. There are many people who want to give protections to animals that now are limited to people and there are people also who want to include trees and other vegetation under these protections. So, we need to examine the Athenian situation and make our judgments about that. Let’s talk about women first. Greek society, like most cultures throughout history, was dominated by men. This was true of the democratic city of Athens in the great days of Pericles, no less than in other Greek cities. Nevertheless, the position of women in classical Athens has been the subject of a great deal of controversy. The bulk of the evidence coming from the law, the actual laws of Athens, from philosophical and moral writings, and from information about the conditions of daily life and the organization of society shows that women were excluded from most public aspects of public life. They could not vote, they could not take part in the political assemblies, they could not hold public office, or take any direct part in politics. Male citizens of all classes had these public responsibilities and opportunities. The same sources show that in the private aspects of life, women were always under the control of a male guardian. A father at first, a husband later, or failing these, an appropriate male relative designated by the law. Women married young, usually between the ages of twelve and eighteen. I think if we think of them as being about fifteen years old we’ll probably have a reasonable average. Husbands, on the other hand, were typically at least 30 and usually over it when they married. So, women were always in a relationship like that of a daughter to a father when you think about the realities of life. Marriages, furthermore, were arranged. By the way, as in other societies, the higher you get in society the more likely it is that these marriages will be arranged with economic considerations, social considerations predominating. As you get lower in society, I can only suspect, because we don’t really have evidence that it was far more informal and maybe that marriages may have been as a consequence of mutual desire than was true of the upper classes. Normally these — I’m shifting again to where we have evidence, and that means probably not the poorest women in the city, the women normally had no choice of their husband. The woman’s dowry, and dowries were required, was controlled by a male relative. Divorce was very difficult for a woman to obtain, for she needed the approval of a male relative, who if he gave that approval had then to be willing to serve as her guardian after the dissolution of her marriage. In case of divorce the dowry would be returned with the woman, but it was still to be controlled in that case by her father, or the appropriate male relative. The main function and responsibility of a respectable Athenian woman, of a citizen family, was to produce male heirs for the household of her husband. If, however, her father’s household lacked a male heir, the daughter became what the Greeks called an epikleros, the heiress to the family property. In that case, she was required by law to marry the man who was the next of kin on her father’s side, in order to produce the desired male offspring. 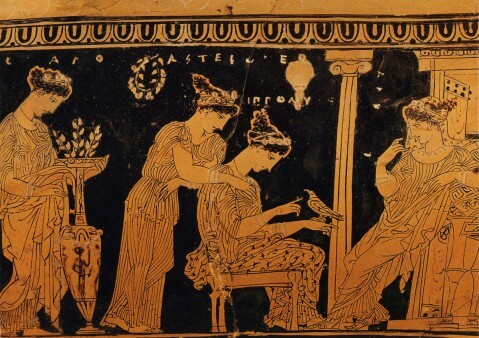 In the Athenian way of thinking, women were lent by one household to another for purposes of bearing and raising a male heir to continue the existence of the oikos, the family establishment. Because the pure and legitimate lineage of the offspring was important women were carefully segregated from men outside the family and were confined to the women’s quarters even in the house. Men might seek sexual gratification in several ways outside the house with prostitutes of high or low style, prostitutes frequently recruited from abroad, but respectable women stayed home to raise the children, cook, weave cloth, and oversee the management of the household. The only public function of women was an important one in the various rituals and festivals of the state religion. There is a very new book by a professor at NYU by the name of Connelly, which studies very carefully all the information that we know about ancient Greek priestesses which reveals, I think, something that we haven’t known enough about before, that women in that realm at least had an enormously important and I would say sort of glorious role in that way. It doesn’t change any of the things I’ve said about the other aspects of life but we’ve really not paid enough attention to this religious side of things and we should remember that religion was very important for these people even though to us it looks as though they were very secular in the way they lived. Religion in their way of thinking was very important. So anyway, apart from these religious things, Athenian women were expected to remain home, quiet, and unnoticed. Pericles told the widows and mothers of the Athenian men who died in the first year of the Peloponnesian War only this. You will either have read or you will read the Pericles famous funeral oration, and he has all these things to say, and at the very end he addresses the widows and the mothers of the men, who have died in a way that puzzles me beyond belief and I still don’t understand why he chose to say what he did. But what he said, I think, was the common wisdom about what the situation was. He said, “your great glory is not to fall short of your natural character and the greatest glory of women is to be least talked about by men, whether for good or ill.” Okay, that’s what they thought. Why the hell did he say it at the end of that funeral oration? If anybody has any insight on that, I would be very grateful if you would tell me about it; now or at any time in the future. The picture derived from these sources is largely accurate, but I would argue that it does not fit in well with what we learn from the evidence of a wholly different set of sources. 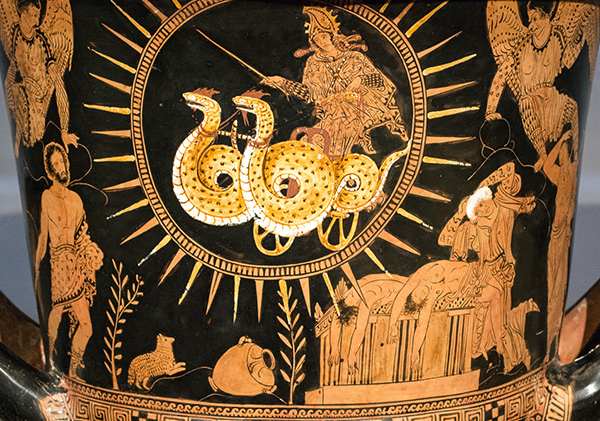 First of all, what we see in the pictorial art chiefly in vase paintings, and even more strikingly I think, in what we learned from the tragedies, and the comedies that were performed every year at two great festivals in Athens. Finally, these things derive very much from the mythology, which is after all their religious tradition of the Athenians. Now these sources often show women as central characters and powerful figures in both the public and the private spheres. 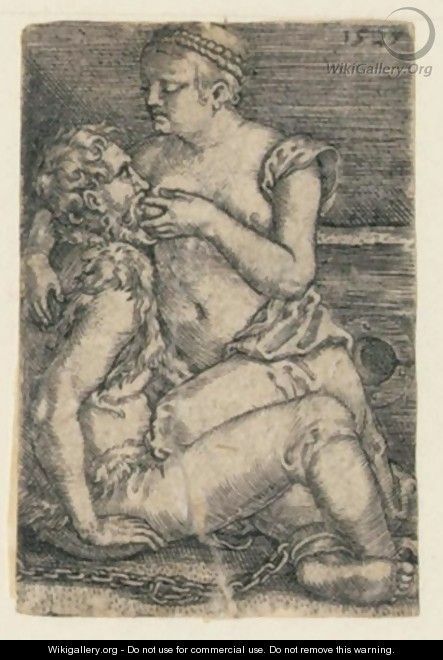 The Clytemnestra, who shows up in Aeschylus’ tragedy Agamemnon, she arranges the murder of her royal husband and establishes the tyranny of her lover whom she dominates. Then there is the terrifying and powerful Medea of Euripides, who negotiates with kings and can commit horrible deeds in her fury, which I think Euripides suggests is very justified fury, even if the deed is not. And these are just two examples of which there are many, in which women are central and important, and powerful, and active, and not passive, and it’s all about them. We are left with an apparent contradiction, clearly revealed by a famous speech in Euripides tragedy Medea and I’d like to read you that. He presented his play at the Dionysiac festival in Athens. His heroine Medea is a foreign woman who has unusual powers. I mean she is practically something like a witch, a sorceress; don’t imagine these Halloween kind of witches, a proper witch is so beautiful that she can bewitch you; think of that. So she’s a foreign woman with these powers, but in the speech that follows she describes the fate of women in terms that appear to give an accurate account of the condition of women in fifth century B.C. Athens. I wonder what the Athenian men in that audience thought about all of that. The picture that Medea paints that women subjected to men accords well of course with much of the evidence, but we have to take note of the fact that the woman who complains of women’s lot is the powerful central figure in a tragedy that is named after her. By the way, it’s not the only case, another of the great tragedies of Attic drama is Sophocles’ Antigone, and Antigone is another heroic woman who defies kings and everybody else in order to do the right thing and who accepts death rather than to give way in her principles. This is not the kind of a woman that Pericles had in mind when he said, just shut up and be sure nobody’s talking about you. Now, this tragedy was produced, we need to remember, at state expense before most of the Athenian population, and was written by a man, who was one of the Athens greatest poets and dramatists. Medea is a cause of terror to the audience, and at the same time, and object of their pity and sympathy as a victim of injustice. She is anything but the creature least talked about by men whether for good or for bad. When those men walked out of that theatre they would be talking about Medea for the next week. 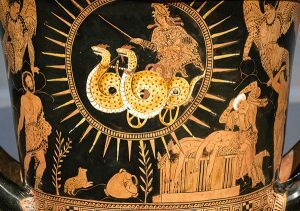 There is reason to believe that the role played by Athenian women may have been more complex than their legal status might suggest. That’s all I feel I can say about that subject because I haven’t been able to resolve the contradiction. Well I won’t go into modern scholarly arguments but let me just say that no matter what they all say, no matter how they come out, this dichotomy is there, it’s in the sources. We need to do something and some supplying for things that are missing if we are to comprehend how both halves of this can be true as I’m sure they both are somehow. Let’s turn next to the question of slavery. In Greece, chattel slavery proper began to increase about five hundred B.C. and it remained an important element in society. The main sources of slaves were war captives and the captives of pirates, who made a living in large part by catching people and selling them as slaves, and of course those people at first enslaved through war piracy or other means, who were sold by slave traders. They did not, unlike in the American south were they successful, nor necessarily did they try, to breed slaves themselves. They were typically bought from slave traders. Like the Chinese, the Egyptians, and almost every other civilized people in the ancient world the Greeks regarded foreigners as inferiors. They called them barbarians, because they uttered words that sounded to the Greeks like bar, bar, bar, bar, bar. 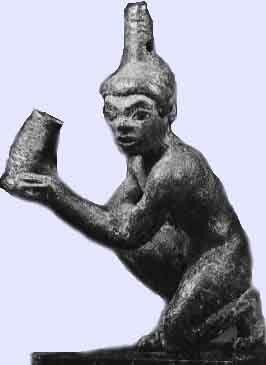 Most slaves, working for the Greeks, were foreigners. 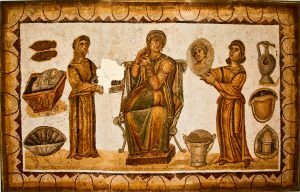 Greeks sometimes enslaved Greeks, but typically not to serve in the Greek home as a servant — really not so much at home. They did use slaves, as I’ve told you earlier, to work on the farms alongside the farmers. The chief occupation, as always before the twentieth century, was agriculture. 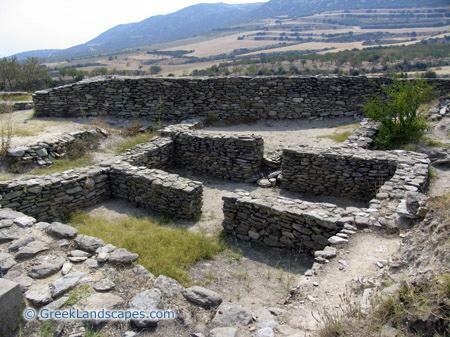 The great majority of Greek farmers worked these small holdings to poor to support even one slave. Some would be so fortunate as to have as many as one or two slaves to work alongside them. I think, as I said earlier, I think probably most of the hoplites could manage that but I think we really don’t know the answer to that. I’m sure they range from zero to more than two, but if you’re thinking one or two you’re probably right. The upper classes had larger farms, of course, that would be led out to free tenant farmers or worked by slaves, generally under an overseer, who was himself a slave. Large landowners generally did not have one single great estate. In every way I want you to try to get out of your head the picture of slavery in the American South with its plantations and great squads of slaves in one place, under one master. That was not the typical way for the Greeks, but rather the wealthy would have several smaller farms scattered about the polis. Well that arrangement did not encourage the amassing of these great hordes of agricultural slaves who would later work the cotton and sugar plantations of the new world. 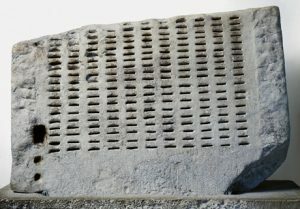 Slaves were used in larger numbers in what I laughingly call industry in the ancient world, I mean handicrafts, but one exception to that typical system was mining. 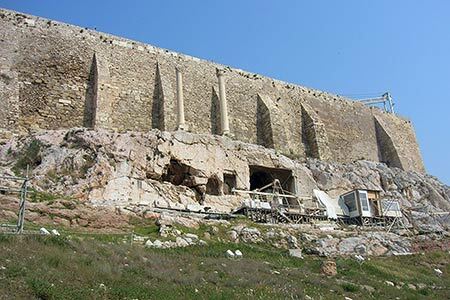 We know something about the mines in southern Athens, where the silver was found and that reveals a different picture. Nicias, a wealthy Athenian of fifth century B.C., owned a thousand slaves, whom he rented to a mining contractor for a profit. But this is unique; we don’t know of anything like this besides this situation, and it’s by far the largest number of slaves that we know any individual held. In another instance of large slave holdings in Athens, a family of resident aliens employed about a hundred and twenty slaves in their shield factory that was the military industrial complex in Athens. Most manufacturing, however, was at very small scale with shops using one or two, or a handful of slaves. Slaves worked as craftsmen in almost every trade, and it was true for the agricultural slaves on small farms, they worked alongside their masters. If you took these slaves that I regard as taking care of the majority of the work in Athens, if you translated them into being handymen or regular workers who worked at jobs regularly who were free, if you went in you went into these shops that’s what you would think, because you didn’t have somebody lashing anybody over great numbers of people. You would have two or three guys working there. One would be the guy who owns it, and maybe the other two guys would be slaves. A significant proportion of slaves of course were domestic servants and many were shepherds. Publicly held slaves also served as policemen; don’t get carried away there were very, very few policemen. They were also prison attendants; there were very, very few prisons and very few prisoners. There were clerks, and there were secretaries and some of them worked their way up because of their natural skills, if they worked — this was usually the case, if you found such people in commerce, and most especially in banking. 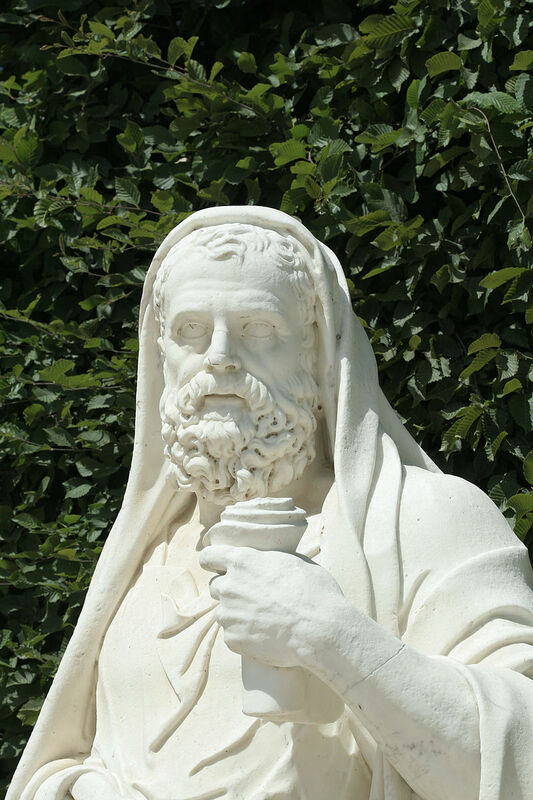 We hear that one of the richest men in Athens in the fourth century was a man called Pazian who had been a slave, and by his talents had bought his own freedom, and then had become one of the richest men in Athens. That’s an oddball story; don’t take that as being very widespread, but it shows you one element in the system. 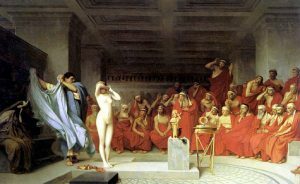 The number of slaves in ancient Greece is a subject of continuing controversy and that’s because we don’t have the kind of evidence to come to a conclusive answer. There are no useful figures for the absolute number of slaves, or for their percentage of the free population, in any city except Athens. There the evidence permits estimates for the slave population in the classical period, by which I mean the fifth and the fourth centuries that range from a low of twenty thousand slaves to a high of about a hundred thousand slaves. If we accept the meaning between these extremes, I love to do that when I don’t have any better thing to do, you come up with sixty thousand slaves. Now, the estimates that are made about the free population of Athens in the same period at this height, some people would say as low as — nobody gets much below forty thousand households, some want to move it up towards about sixty thousand households. What do I come up with? Right fifty thousand – that would yield a figure of fewer than two slaves per family. It has been estimated that only a quarter to a third of free Athenians owned any slaves at all. So, the distribution was unequal, with most families having no slaves and some families having many. Some historians have noted that in the American south, in the period before the Civil War, where slaves also made up less than a third of the total population and three quarters of free southerners had no slaves. 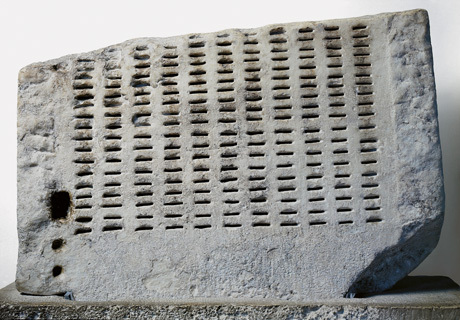 The proportion of slaves to free citizens was similar to that in ancient Athens. Because slavery was so important to the economy of the south, these historians suggested it may have been equally important and similarly oppressive in ancient Athens. I find several problems with this analogy. For one thing it’s important to make a distinction between a world such as the cotton states of the American south before the Civil War, where a single cash crop well suited for exploitation by large groups of slaves, dominates the economy, and a society like the one in Athens, where the economy was mixed, the crops varied, the land and its distribution very poorly suited to massive slavery. Another major difference is in the likelihood of a slave achieving freedom. The freeing of American slaves, although it happened, was comparatively rare, but in Greece it was very common. The most famous example I’ve told you already about, Pasion who began as a bank clerk, earned his freedom, became Athens richest banker, and then was even rewarded with Athenian citizenship but that’s very rare. On the other hand, the acquisition of freedom by slaves was not. People frequently free their slaves on their own death and often before that for various reasons. It’s also important to distinguish the American south where the slaves were distinguished from their masters by skin color, where the masters were increasingly hostile to the idea of freeing slaves, and in terror of slave rebellions with a very different society of classical Athens. There slaves walked the streets with such ease as to offend noblemen, who were class conscious. This, then, is why in the matter of free speech we have put slaves and free men on equal terms. Now a lot of this is absolute baloney; this is some right wing character who is just so annoyed with Athenian democracy that he is making over the top statements, but it cannot be so far removed from reality as to be ridiculous or else it wouldn’t be in any persuasive. So, I think we have to imagine slaves moved about Athens with a degree of ease and security and as must rightly be saying you really couldn’t tell a slave from a free man very readily in ancient Athens. All of this is meant to be by contrast with the picture of the south. Even more remarkable, the Athenians were on occasion willing to contemplate the liberation of all their slaves. 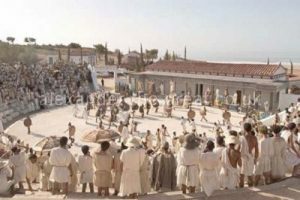 In 406, their city facing defeat in the Peloponnesian War, they freed all slaves of military age and granted citizenship to those who rode the ships that won the Battle of Arginusae. Twice more, at crucial moments, similar proposals were made although without success. Now during the Civil War people did suggest to the South that they liberate their slaves and enroll them in the Southern army and such ideas were always quashed, and I think we can read something very important into the difference between the two situations. The southerners were afraid to do it because they didn’t trust the slaves not to turn on them and kill them if they were armed. The Athenians just didn’t have that fear at all and I think that’s a big story about the difference between the two systems. Okay, that’s all I have to say about these subjects. Why did the Athenians not fear their slaves? They did not fear their slaves, because I think in the first place they did not treat them so harshly as to create that kind of absolute hatred that nothing could take care of. Second of all, I think because the prospect of their liberation being not an out of the question idea softened the edge between master and slave to a degree where the Athenians didn’t have that sense these people are waiting to kill me. I guess another thing is since so many of them — first of all you start with household slaves, well even in the south there were very, very few household slaves, who did not develop friendly and warm feelings towards the people in the house. So, that takes care of another situation and than there are all these slaves who worked side by side with their master, not as part of a gang under an overseer, but as a fellow worker with their farmers. So, the whole way of thinking about it I think was so different that — and here’s another thing, we never hear of a slave rebellion among the polis of Athens. We do hear of helot rebellions, of course. It doesn’t fit the mold in Sparta, but we never hear of a slave rebellion in spite of all the troubles these towns have. So, I think those would be the reasons. When slaves had skills, it was in the master’s interest to encourage them to do their work to the best of their ability, and so they rewarded them by letting them keep part of the profits of what they produced and it was that of course which allowed some of these people to buy their own freedom. It is true that that happened in the south as well. I’m sure there must have been runaway slaves, but it’s just a non-issue so far as we can see. It’s the big deal in the south and the north when fugitive slave laws become a great source of trouble, but I think there was not too much running away of slaves, because there really wasn’t any place to run to. There was no place where there wasn’t slavery. So if an Athenian slave runs to the Boeotia, he’s going to be a Boeotian slave, I think that was one of the reasons and put that together with a rather gentle arrangements I’ve described, the combination I think reduced the problem of runaway slaves. What was different about slavery in Sparta? The Spartan situation as compared to the Athenian situation, night and day. The helots, I’ve told you all about it; you’ve read all about it, and as a man leading the rebellion in Sparta at the beginning of the fourth century said about helots and other people who were not Spartiates in Lacedaemon, they would have gladly eaten the Spartans raw.